The 1943 race riot on Woodward, via Detroiturbex.com. Never before have you been able to so starkly see the impact that time has had on Detroit. Taking before-and-after pictures to an new level, the pioneers at Detroiturbex.com have painstakingly matched up historic photos with current ones. What makes this cool is a sliding bar that give you the ability to seamlessly move the historic photos over the current ones to get a wondrous sense of change. Detroiturbex.com, which documents the demise of the city’s landmarks and buildings, takes you on a journey through time in downtown, at the Packard Plant, the 1967 riots and so much more. The website caught national attention after creating a fascinating interactive feature on the historic Cass Tech High School after it was demolished in 2011. 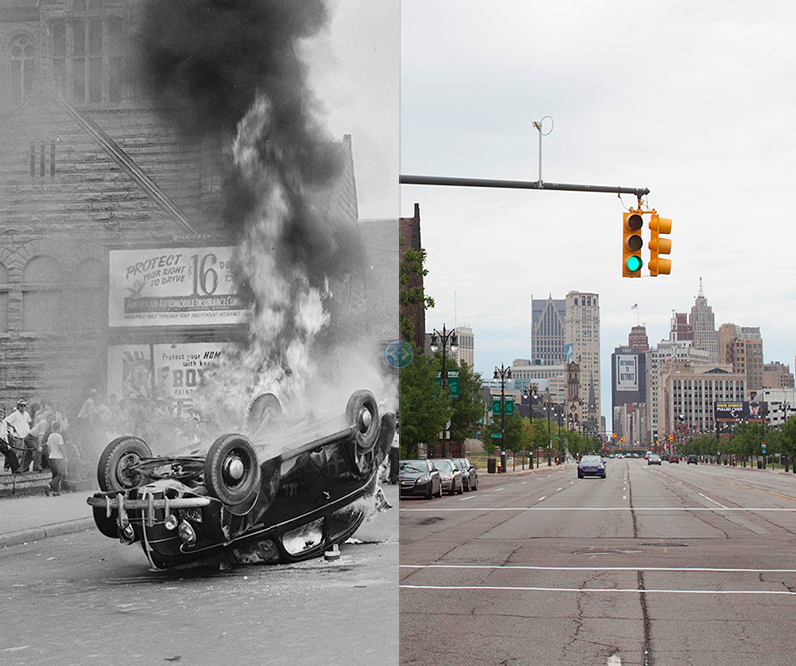 A marvelous compilation of Detroit then versus now. Thanks for posting this.